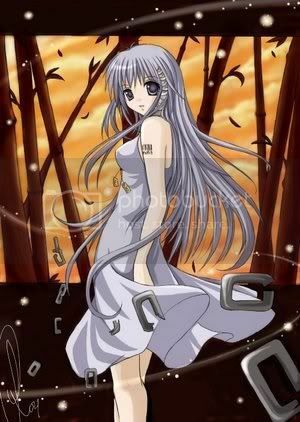 Goddess Inoue aka Hailey is a 104 year old (DOB: December 25, 1914) muggle-born witch living in Godrics Hollow. She wields a 12½" Rosewood, Phoenix Feather wand, and is a member of the unsorted masses of Hogwarts students just off the train eagerly crowding around the Sorting Hat. Her favorite Harry Potter book is Harry Potter and the Half-Blood Prince and her favorite Harry Potter character is Nymphadora Tonks. Born during the first world war, Inoue was left by her muggle parents as an orphan in the midst of a town that was about to get bombed. She somehow managed to survive all the rampage and was found by Karen and Revan who raised her as their own child. Inoue didn't have the strenght to be a good fighter but had the speed to be a feared assassin. Her moves and actions were based on Speed and Illusions. When Inoue was old enough, she left the family to train and live on her own. She learned the ways of elementals and Dark arts, which she admired very much. She turned out to be a killer. Carrying her Katana everywhere with her. Learning the ways of the hybrid werewolves, Inoue became even stronger. Slowly but surely, Inoue became a slave of her own power. Old friends know her as the Espada. A lost warrior, in search of good battles. Inoue got depressed and afraid of her own self and decided to jump out of this life given to her. Now, the day has come that Inoue found rebirth as a loving spirit. She gave her Katana, Rinsei, to one of her old pupils, called CoolClawz. CoolClawz also got blinded by the Katana's powers and Inoue was forced to take it back from him. She has now passed it on to her first son, HaloMaster. She kept her Speed and the power to transform everything she touches into cherry blossoms, her powers to create mirages and illusions are slowly fading but are still very powerful although she doesn't use it for the purpose of evil anymore. Now, Inoue is thinking about raising her own family. Deep inside, evil can still be found in the edges of her heart, but she just doesn't pay attention to it anymore.